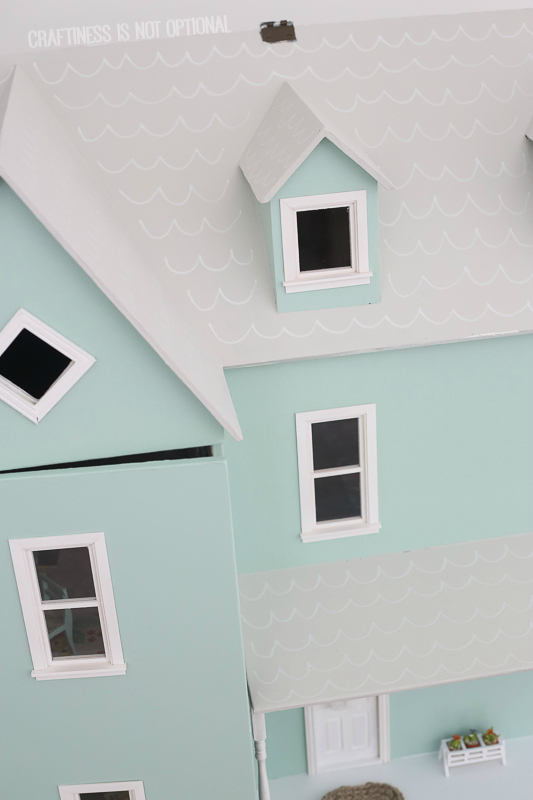 As you may know, I’ve been working on this dollhouse for…..many months. I had a while where I was OBSESSIVELY working on it feverishly, and then I had to wait for some things to come in the mail…and my momentum kinda slowed down, then stopped. 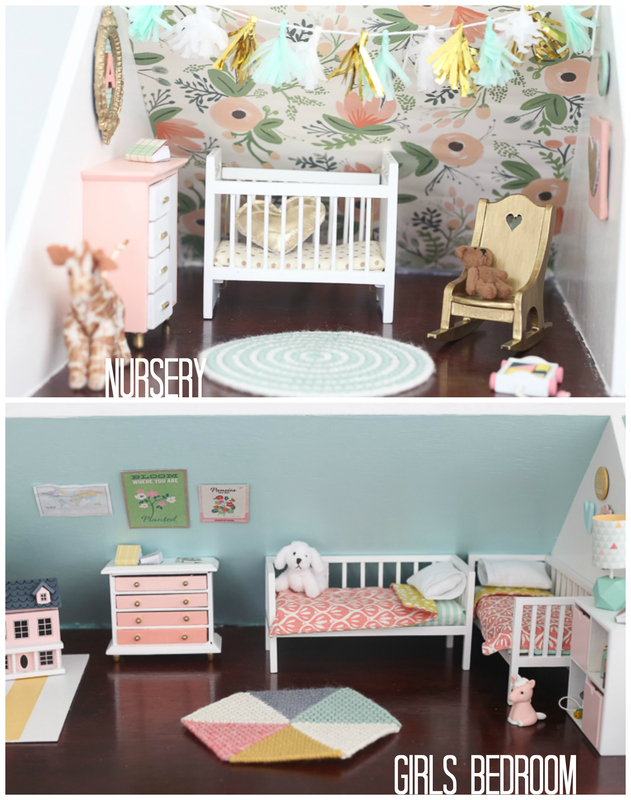 Recently I’ve been finishing and re-decorating our playroom-which is where the dollhouse was going, so…kick in the pants to finish it, here I come! I finished up some last minute projects, painted the outside, painted new windows, and wha-la! The post started out excruciatingly long, kudos to you if you stick with me til the end. I’ll give you a high five if you do. Out of absolute necessity (otherwise this post would take AGES to read), I’ve split up the posts into 3 posts-each floor of the house will get it’s own post with the info for it, and then I’ll link to them in this main post. Also, there will be many links, some affiliate, some not. Just assume the amazon ones are affl links, and the others aren’t. 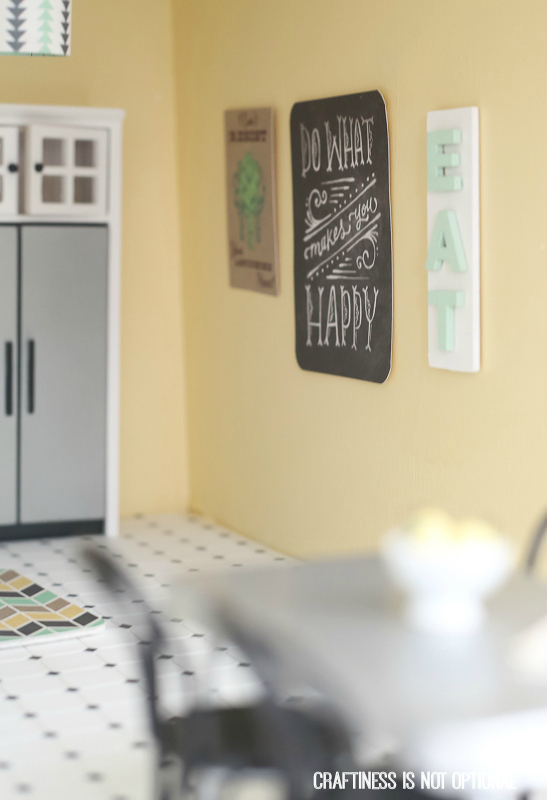 I had the honor of having some AWESOME blogging friends contribute to this dollhouse, so I will definitely shout out when I talk about something sent to me. let’s start with the house itself. I bought it from a guy on eBay, whose wife had started it but never finished. It was an AMAZING deal. The kit is close to $500 new but I think the guy wanted it gone, so I got it for $80. YES you read that right. It was pick up only but since he was in LA, we stopped by while Rory and I were frolicking in Disneyland for our 10th anniversary in Feb. It came with a ton of furniture, etc….some of which I used, some of which I plan to re-sell since I don’t need it. I love that it closes in the front-that was important to me since I don’t trust Ava (or other kids, I”ll be honest) to play nicely with it yet. C and S are surprisingly gentle and good with everything. I made a little wreath for the front door (which has no handle yet-oops) out of a cardstock circle, beads, and felt. Delia made me the front mat, and RaeAnna sent me the CUTEST little succulent planter. I mixed a color for the outside so don’t ask what it is, lol. the grey on the roof is Dolphin Fin by Behr…and I used a sharpie paint pen to draw some scallops on. they are supposed to represent shingles. Just nod your head with me, mkay? today we will cover the bottom floor. paint color: …yellow of course…mixed it myself. The floor is some of this tile, and the lady who had been working on the house had already cut it to fit this room. perfect! thanks, lady. various plates from eBay, then I printed out some patterns and mod podged them to the plates…and or painted them. everything is hung on the walls with that poster putty stuff. I bought a fun vintage sheet of scrapbook paper when I was in Portland at a shop called Collage and cut it up to hang in the kitchen, and some in the girls room. 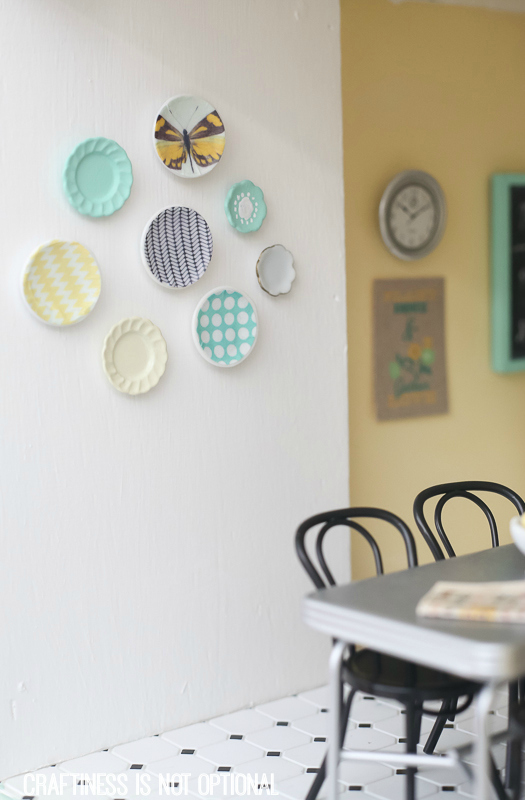 the kitchen set is from this shop, and I ADORE it. I made the little food canisters with wooden beads, little wood circles, and a bead glued together, then painted. I penned the “labels” on with a fine tip sharpie. The rug is a scrapbooking journaling card (with felt glued to the back for some weight) from the We R Memory Keepers brand. I bought a few of the packs at Target, and used them throughout the house for art work and tons of other stuff! 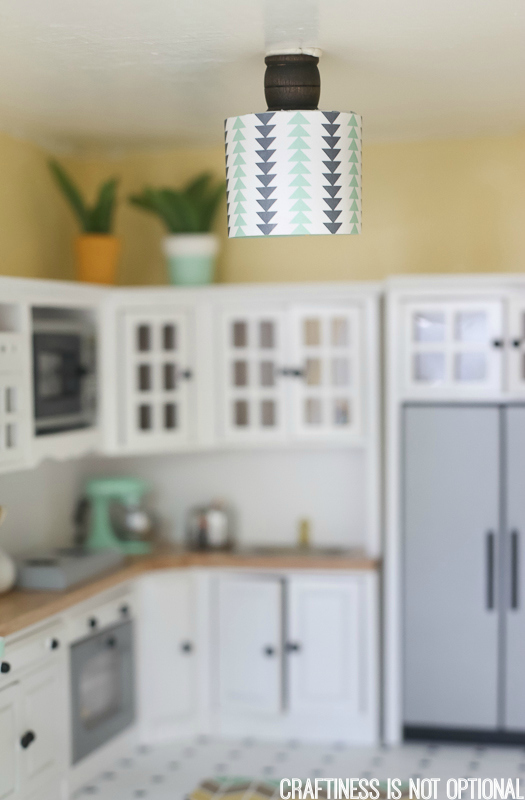 here’s another piece of that paper in action-I made a little light for the kitchen…ghetto-ly stuck up on the ceiling…heh. 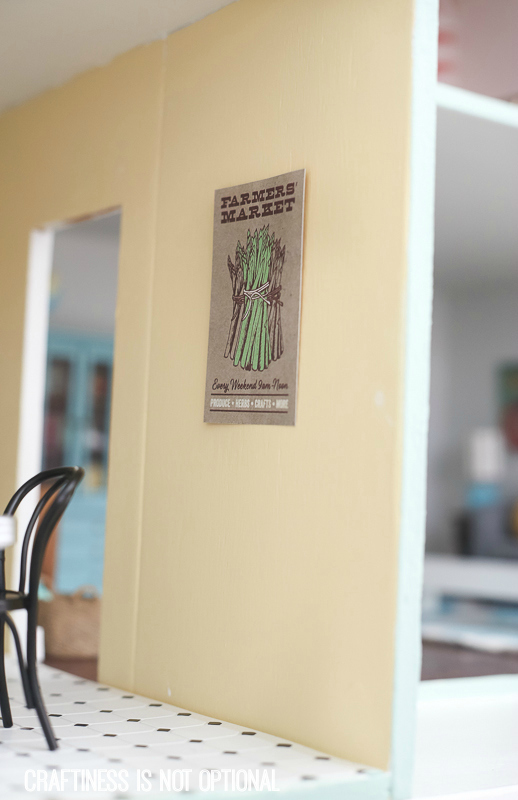 I made an EAT sign with some wooden letters and balsa wood…the other things on the wall are from the paper pack & that piece of scrapbook paper. 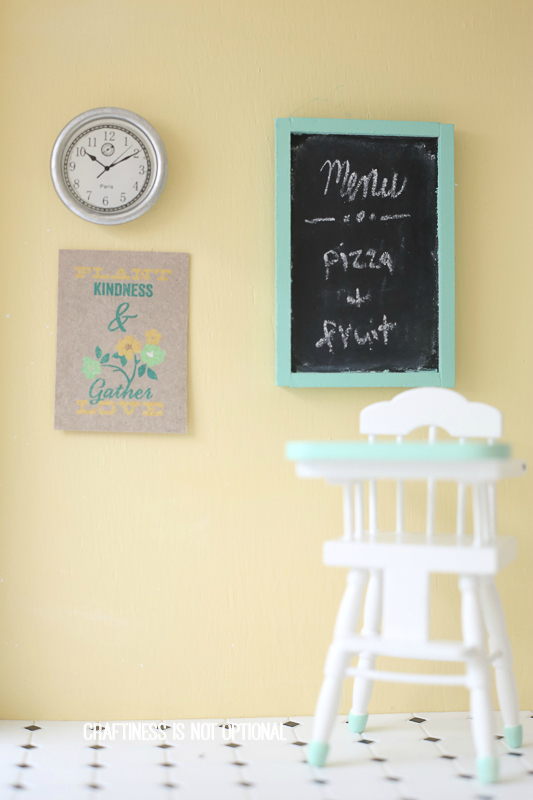 clock, chalkboard…the high chair is part of the nursery set that a group of my fabulous bloggy friends sent me. I painted a few parts with some mint pant. the clay pots I got from Hobby Lobby, painted, and glued some fake leaves inside. I have to point out this MINT kitchen aid. I had to have it! Found it on Etsy, but the seller doesn’t have this color anymore. 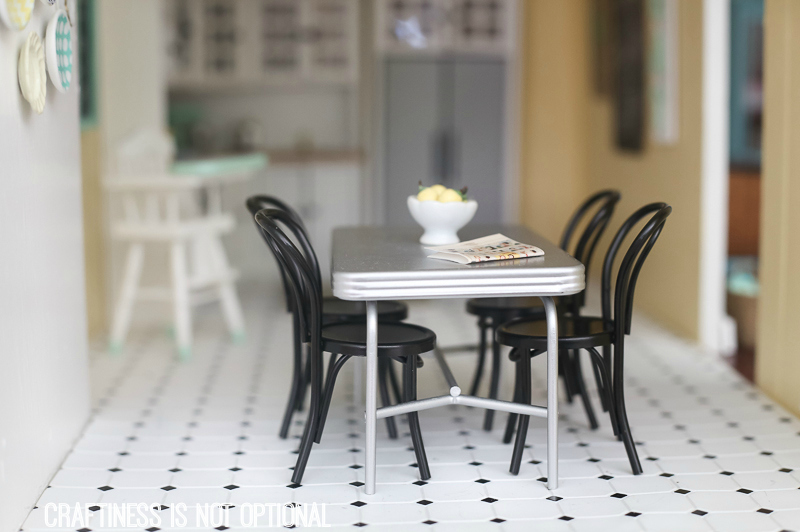 paint color is Silver Tradition by Behr. I put in “baseboards” in this room, the master, and the bathroom. 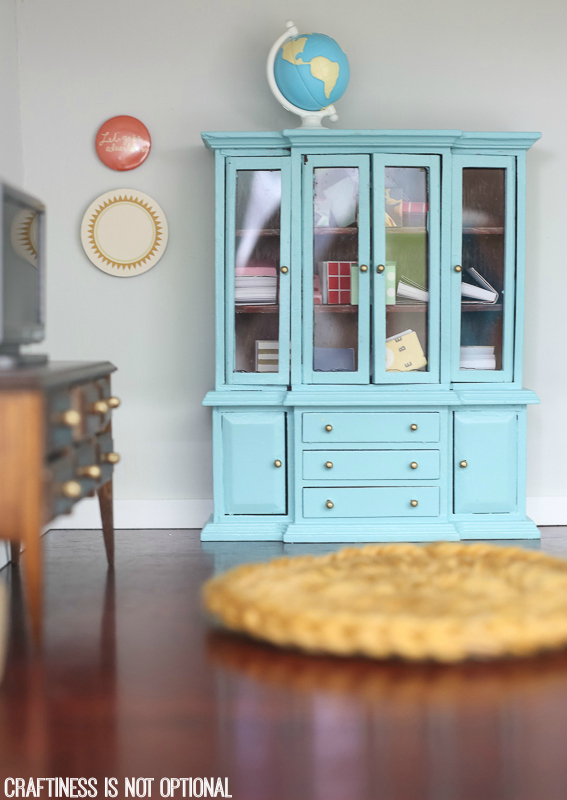 This awesome hutch came with the house-it had some ugly fancy trim on top, which I snapped off neatly (it was just glued on), sanded down, then painted this fun aqua color! I painted the knobs with brass martha stewart gilding-all the gold finishes you see around the house were done with this. the little globe is a Little People globe, found on Ebay. Delia crocheted me this rug, too, which fits perfectly in this little spot! 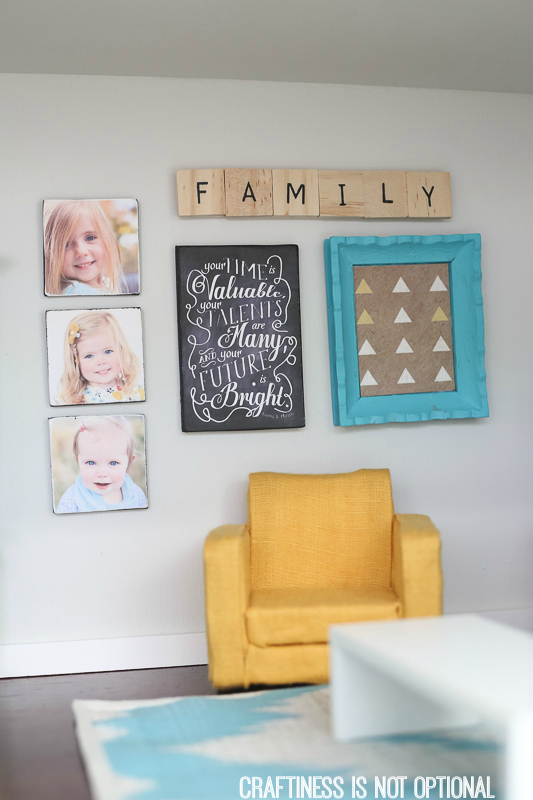 I made all the art on this wall-the little “canvases” of the girls I printed off, then glued to chipboard squares (I knew I hoarded my old scrapbook supplies for a reason! ), and painted the edges black. Same thing with the chalkboard saying, found it on Pinterest (source). Painted a frame teal, from Hobby Lobby, I think, then stuck some paper from that faithful journaling pack inside. Glued some wooden letters onto a popsicle stick for the family sign. I made the mustard chair with this tutorial…only smaller dimensions. The couch was made with that tute as well! I covered it in some Yarn dyed black Essex linen, which worked out great! I made a wee little bow pillow also. Side tables were bought in a ebay lot. The lamp made using my tutorial. the apple poster is from that trusty scrapbook piece of paper, and the yellow chevron “canvas” I made with a little piece of craft wood and some tape. The large sign I made with some popsicle sticks, and cut out vinyl with my Silhouette to make a stencil, copying this sign. The side table was from that ebay lot, painted the knobs and called it good. I had to have this awesome flatscreen TV. Basket (from my group of girls! ), artwork is from that journaling pack, frame from Hobby Lobby. I stuck some flip flop stickers I had in the basket…ha! 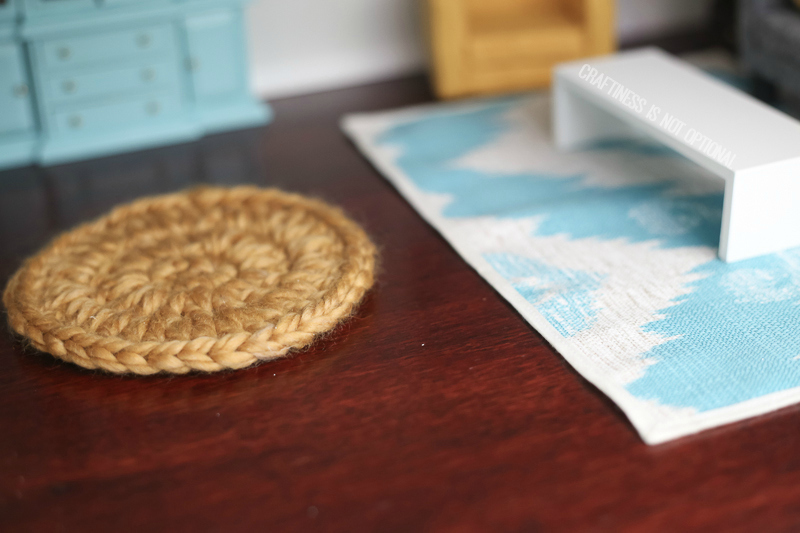 The teal rug is a scrap of outdoor fabric (I made a faux roman shade out of it for my real kitchen), with some skinny bias tape sewn around the edge. phew! meet you back here for the next level of the dollhouse in a few days! Wow, this is so beautiful. I’d like to live there. Oh wow! High five! I now really wish I had girls. What a fantastic house. Oh my gosh. I’m in love. My mom decorated a couple of dollhouses once, but she bought everything. So impressed by your creativity! OMG!!!! I LOVE IT!!! Everything is so darn sweet! You must have had a blast choosing pieces, making pieces, and putting it all together! This is something that I would like to do…. Maybe one day!! Where to start?! This is freaking AWESOME!!!! It looks absolutely incredible!!! You can see how much work you’ve put in to bring it all together, and I am looking forward to seeing the rest of the house!!! Congratulations on a fabulous job well done!!! 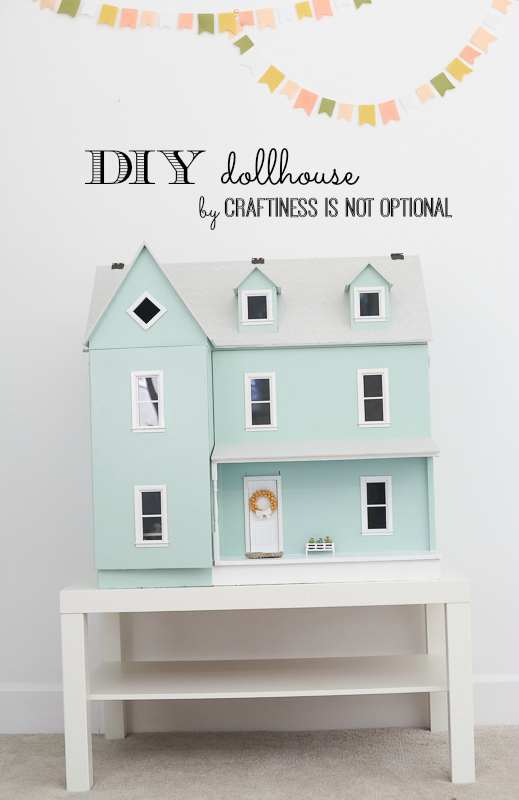 I just spend 2 weeks collecting different craft materials with the idea of building my own dollhouse and you post is just the perfect way of the universe saying that I can get staring… THANKS for all the tutorials. Now my doll house is going to be magic! Hello! 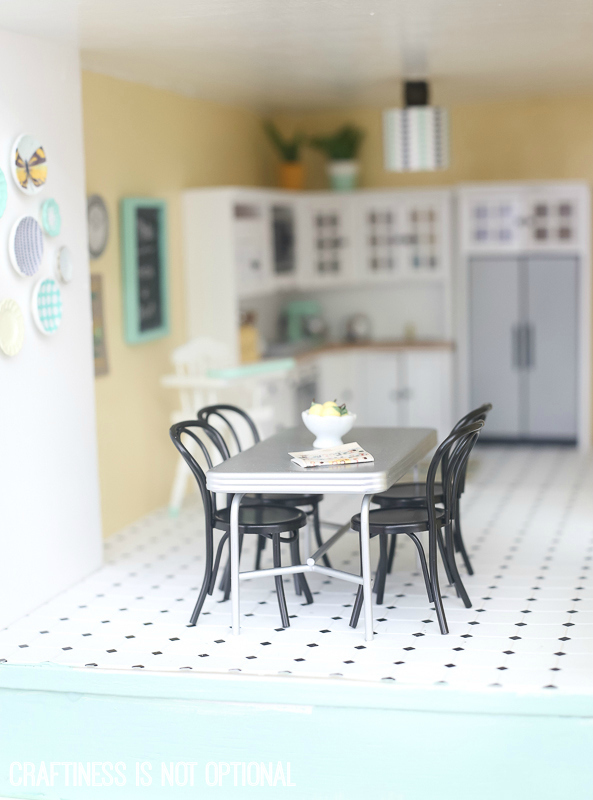 Love your dollhouse and your photos of it are awesome. 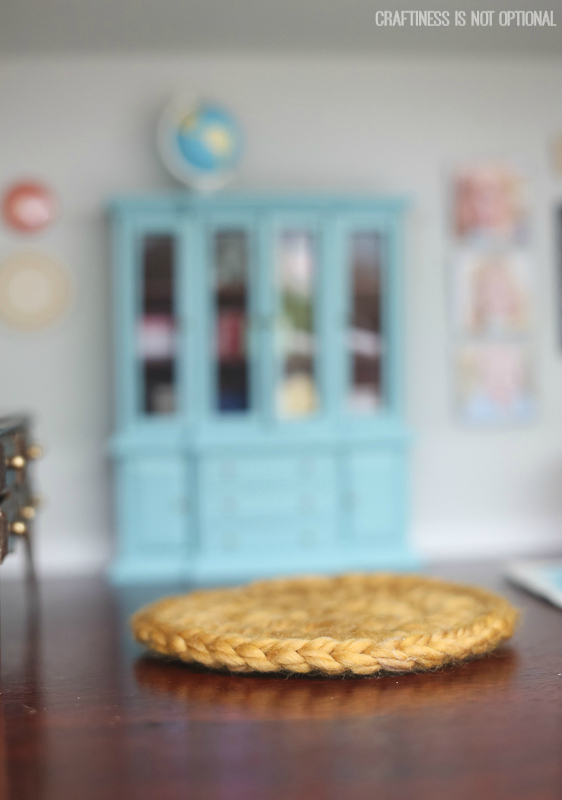 I too have a miniature obsession…and I’m now feeling inspired to revisit it today and maybe take a sunny pic or two. Thanks! Oh. My…..WHAT A TREASURE!!! Such a priceless addition to your playroom….. I loved seeing all the IG ‘sneak peeks’, but this blows me out of the water. Seriously amazing!! Looking forward to seeing the next levels, but glad to have a few days to process the loveliness on this one…. This is my Favorite Thing On the Internet Ever. That’s not hyperbole. It’s incredible in every way. This is the coolest dollhouse ever. I love your mix of purchased, DIY’d, and gifted from friends. 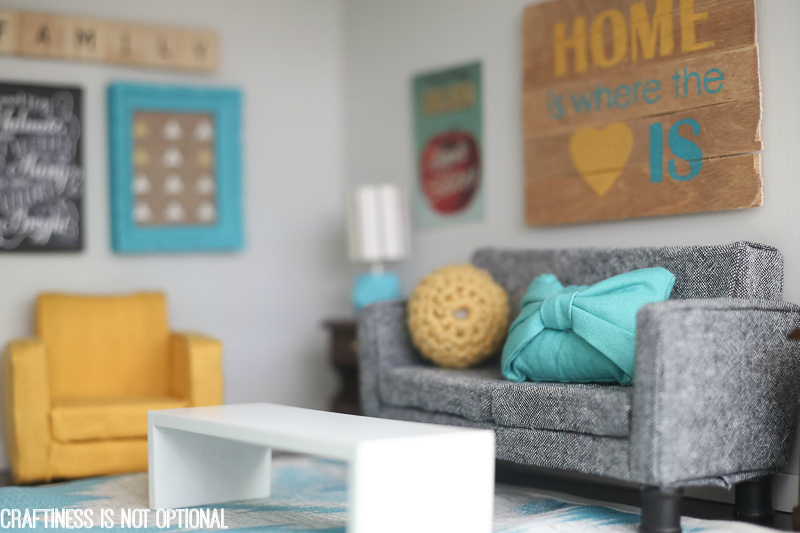 That mix is what makes a home special (doll or “real”). Can’t wait to see how you pulled together the rest of it! I am so jealous of this dollshouse! 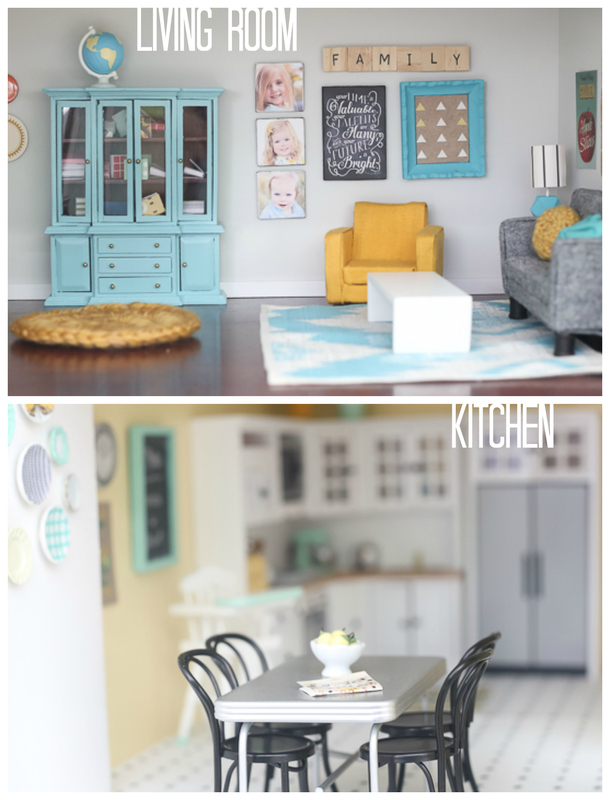 This dollhouse is nicer than my real house! LOL I hope they treasure it! This is amazing! You did such a great job! The art canvases of your girls are so stinking cute ! ^Exactly the same thoughts as Karen N. DARLING!!! I could play with this for hours. Can you come and decorate my real house ? Your dollhouse is AMAZING!!! It is absolutely beautiful!! I love it!! Geez, this looks better than my real home! Great job! 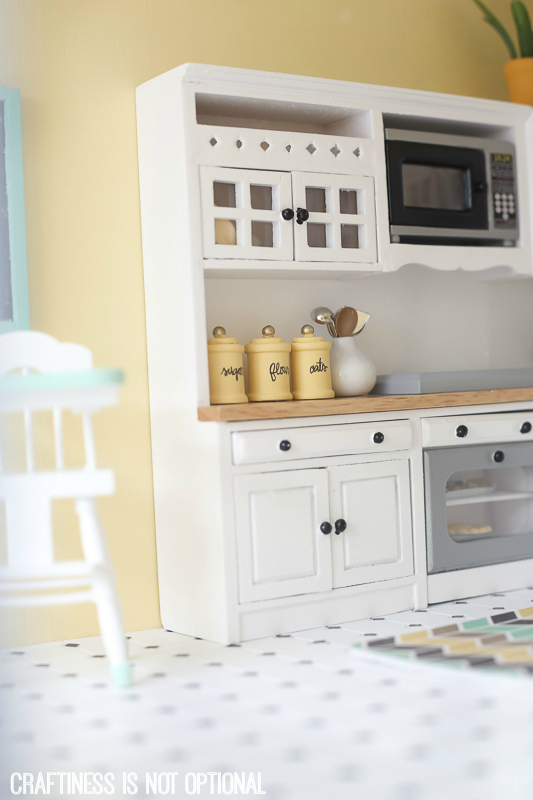 Really inspiring to make a dollhouse someday when we have kids…although it looks pretty tempting to play with it myself. Hi! Love your dollhouse updates. I am working on one too for my daughter. I wanted to offer to make something for yours. I have a blog focused on machine embroidery and monogramming. I was thinking for my dollhouse it would be fun to monogram sofa pillows, bed coverlets or a welcome mat. I’m not there yet for mine but would be happy to do one for yours. Let me know – it would be fun to collaborate. My blog is http://www.modern-monogramming.com. Thanks! This is friggin awesome. How talented are you abc how lucky are your munchkins. Wow wow wow. 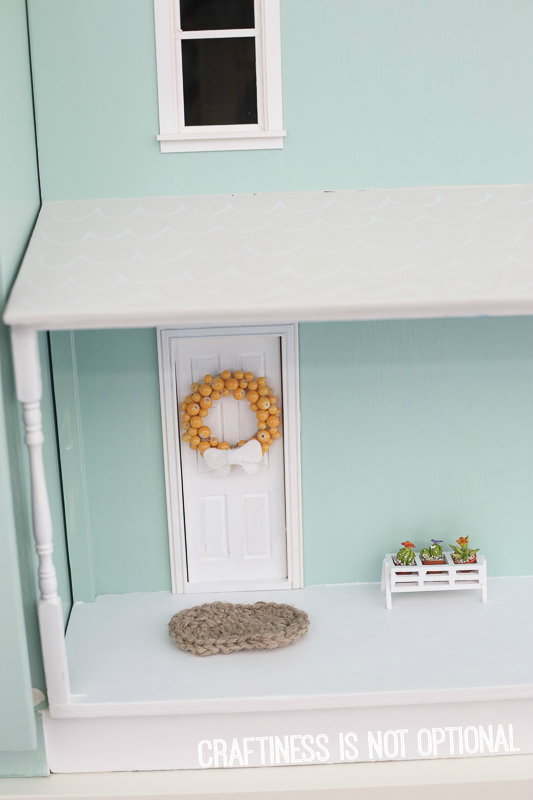 How is a miniature dollhouse better designed and decorated than my own?! Fabulous job! I want to live in that house, over the top fabulous!!!! This is so incredibly cute. I love the veranda! And all the little details inside! You are amazing, the time and patience…. Wow! I love it! I guess I’m not the only one who scrolled through all these pictures thinking, “This is better than where I live!” I’m always amazed at folks like you who have the patience to pay such attention to little details. It’s so well done! Everything you make (literally everything) is SO SO SO stinking cute! Love this so much. Wow! This is the coolest doll house I’ve ever seen. 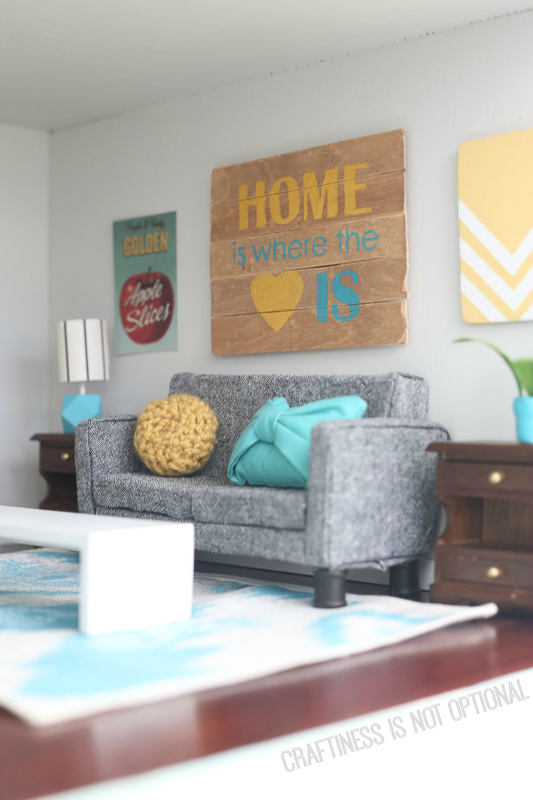 I saw a picture pinned on Pinterest and thought it was a real room until I read the caption and clicked through to your blog. Thanks for sharing the details. I also want to live there! Amazing inspiration. Two questions: how will your littlest girl not wreck it like my kids trash their dolls house! And what kind of dolls are going to live there? My girls would love this doll house! The furniture looks amazing. Just amazing! Totally in love with this doll house. Very inspiring. This is beyond friggin’ amazing. Wow!!!! Makes me want to build a doll house, that’s amazing work! Aw!!! Yay! I’m so glad the little planter looks so cute! You are amazing and I am swooning from all the awesomeness in this house! This is really so awesome! 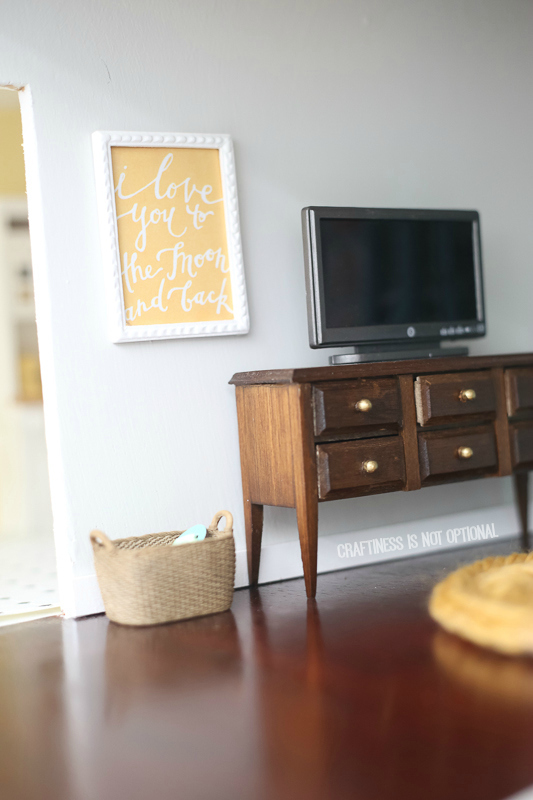 You have single handedly inspired me to take on revamping our sad old dollhouse- I am in awe of your craftiness! wow – this is really, really awesome – you’ve done a great job! my mom and grandma made me a dollhouse when i was 8 years old (we still have it) and it was so beautiful and perfectly small so i may have an idea how your kids feel about having it and playing with it (pure love). and now you have reminded me that i wanted to update my dollhouse for my daughter! Lucy just said….If they could just ask workers to make a bunch of that exact same house I would totally buy it! Jess, this is AMAZING!!! You are so talented and so inspiring! 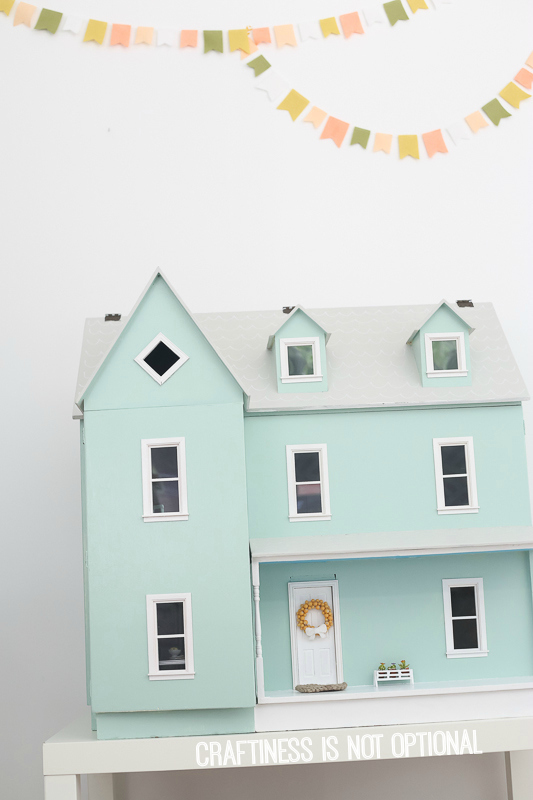 I was given a dollhouse when I was younger, for my Barbies and I loved it! (It was very simple in comparison to your stunning one!). Looking at this makes me want to have a go at updating mine. Jeez… I can’t even decorate my own house and here you are rockin’ out this dollhouse! Two big ol’ thumbs up to you Jess! Wow!! This is incredible!! I forget I’m looking in a dollhouse and not a real home. So detailed!! Makes me want to create one!! This is INSANE! I can’t even pick a favorite part. It’s all just sooo pretty! That’s called some serious care for details- and I love it!! I hope it lasts for generations to come seeing how much time/work you have put into this little treasure!! Oh my!!! this is sooooo CUTE!!! this is the first time I see a dollshouse in modern colors and styling. I’ll be sharing and linking to your blog. I shared your fabulous project on my blog, with a picture. Hope you’ll get new visitors from it. Thank you for the inspiration! You are VERY talented! Thank you for sharing! I love all of your ideas! this is beyond amazing! I built a dollhouse for my girls but it is like a druggie trailer trash house on the inside compared to this! So great, attention to detail is flawless. haha! nooo yours is AWEsome!! Hi – I love this, it’s a true heirloom piece. Just wondering if you know the name of the journal pack that you used? I can’t see it anywhere. Thank you! Seriously appreciate that you took the time to source that. very, very cute I loved how creative your are, the rooms are very warm and inviting the colors are soft and refreshing!! I LOVE it! I’m planning to make one for my girls this year and I was wondering what kind of dolls you use in it? Thanks! I got some 1:12 scale dolls on Amazon! This is so adorable! 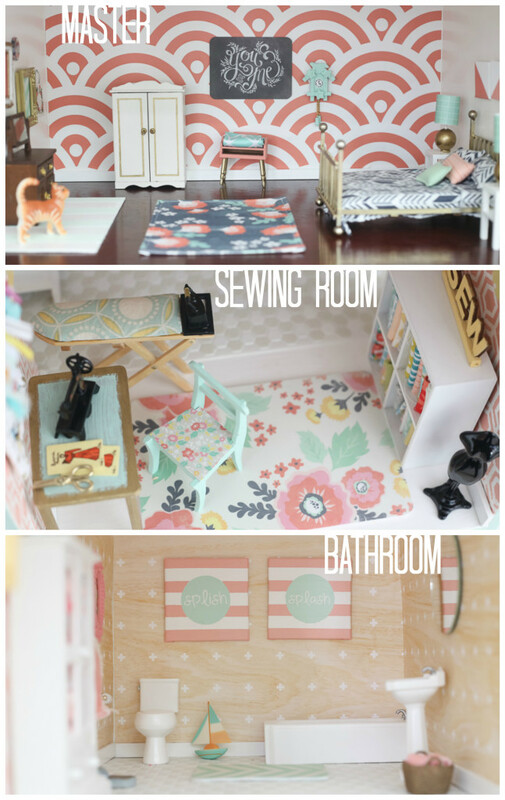 Makes me really want to start working on a dollhouse again. Love everything about it! This is awesome! I am presently planning a remodel to a wooden Barbie house I purchased for my daughter for her 5th bday around 1993. I purchased it from a woman locally who had some great and some not so great pieces. It is a 4 room with 2 upper bedrooms, a lower kitchen and living/dining room. At the time, I painted the rooms, added carpet and ‘vinyl’ flooring , sewed bed linens. I have a 4 1/2 year old granddaughter, and have been given the ‘go-ahead’ to fix it up for her! I love that your house is ‘real’ and not phony pink, gaudy atrocity like most Barbie housing and furniture. Question: I would like to add a window over the kitchen sink, but not cut an opening due to livingroom on opposite side. What would you suggest, popsicle sticks cut down or balsa wood? I am so going for this!!! Thanks so much for such a wonderful DIY! Wow, this is beautiful! 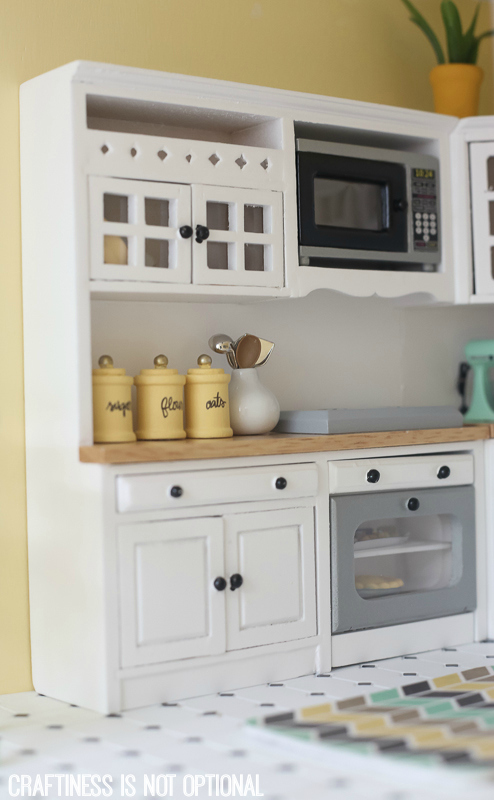 I am amazed at all creativity and the fine details you put into this dollhouse. WELL DONE!! 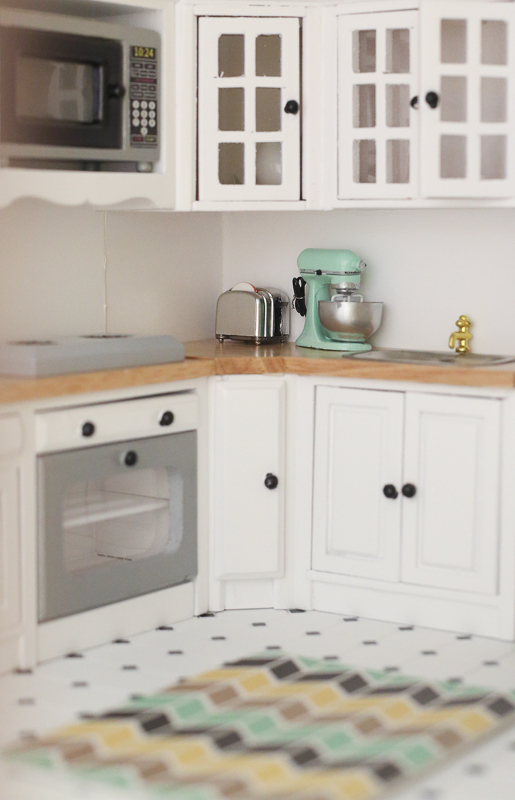 I am completely obsessed with this dollhouse. Best ever. EVER. Hello, can I please ask what type of paint you used for the furniture? (i.e. the bookcase)? The finish looks so smooth. I wanted to spray paint my furniture but I’m afraid I will mess it up. Thanks! Thanks Jess. Did you use a paint brush or a roller? Sooo beautifull dollhouse, i love it ! Congratulations for this pretty house ! Amazing!! My little wants a barbie house for christmas ( not sure if i can even come close to yours!!!) but i was wondering if you could tell me what you used to make the kitchen light and how you put it together. thanks so much for all your hard work! This is probably the most beautiful house I’ve ever seen of any size. Even your “sloppy” looks adorable. Thank you for sharing. Now I just get to wish I had the time to be this detailed for my nieces! Jess, I know this post is a bit older, but can you tell me where you found the miniature dollhouse for your dollhouse? I can’t seem to find the correct keywords for finding one of my own. Thanks! Hi, you did a great job!! Do you remember the name of the dollhouse and is it 1:12 scale? The link to the page is no longer available.